As I type this entry the sun is shining and for once we are enjoying a wonderful summer of dry days and very warm temperatures. This was not the case back in 2010 when we went to Wales for our ‘summer’ holiday. We were staying in a cottage in Ceredigion, in mid Wales. The countryside all around was very beautiful but it was largely overcast and wet. Certainly very different to the weather we have enjoyed in recent weeks. Nevertheless these conditions can provide some good photographic opportunities, as the picture below illustrates. When this shot was taken (in the first week of August of 2010) I was only just beginning my interest in photography and everything was taken in colour, not black and white. Looking back through the archives I found this image. 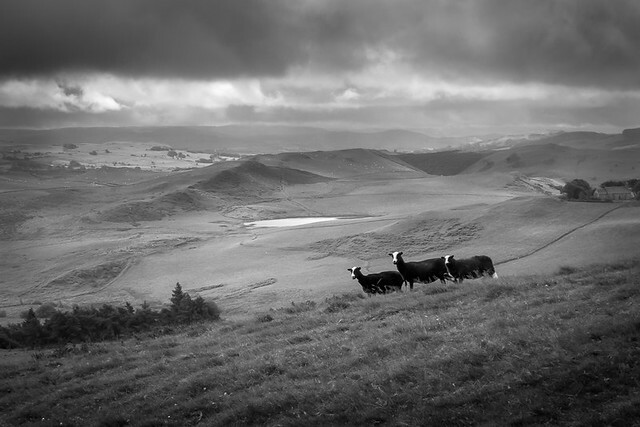 In colour it really had very little going for it, but when converted to monochrome the three sheep stand out and the rain clouds circling the surrounding hills were typical of the conditions we experienced. Although I love Scotland, Wales is a little nearer, so I hope it will not be long before I can return and explore the hills and coastline of this unspoilt country.